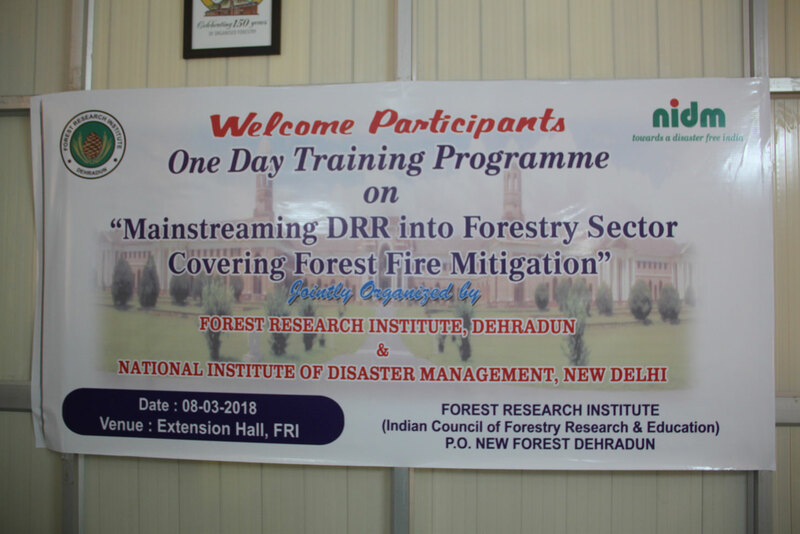 One day training programme on “Mainstreaming DDR into Forestry Sector covering Forest Fire Mitigation” organized by FRI in collaboration with National Institute of Disaster Management, New Delhi on 8 March 2018. The participants of the training were officers of NDFR and forest officers from different States of India. The programme of the training was to sensitize participants in Forest Fire Management and Mitigation. The experience faculties from Indian Institute of Remote Sensing, FRI and Forest Survey of India have invited by FRI on delivering lectures on use of remote sensing in forest fire detection, development of forest fire danger rating models and role of forest invasive species in forest fire. The participants were also discussed various issues of forest fire management and mitigation with the coordinating officers from Silviculture and Management Division of FRI Dr. T.R. Pandyan, Assistant Silviculturist and Sh. V.K. Dhawan, Forestry Expert. A day field demonstration on prevention of forest fire and control was also organized at Forest Fire Master Control Station of Malsi forest range of Mussoorie Forest Division wherein participants were demonstrated on forest fire vulnerability study and use of forest fire tools for the control of forest fire in the field. Dr. A.D. Kaushik, Senior Faculty coordinated training programme from NIDM, New Delhi.